The subject of this striking portrait, Heinrich Thannhauser, founded a gallery in Munich that hosted a landmark exhibition of more than 90 works by Vincent van Gogh in 1908. Three years later, he organized the first exhibition of the Expressionist group Der Blaue Reiter (“The Blue Rider”) with artists Wassily Kandinsky and Franz Marc. The first comprehensive exhibition outside France of the works of Pablo Picasso followed in 1913. Thannhauser left Germany during the Nazi period; his son, Justin, later bequeathed the family’s collection of modern art to the Guggenheim Museum, New York. The artist, Lovis Corinth, is famous for his masterful draftsmanship and vigorous brushwork. Of all the artist’s portraits, this one may be the most abstract in terms of its composition. Poised against a geometric background, the sitter’s stark costume pushes his body forward. Corinth’s genius with a brush is apparent in the deliberate touches of white here and there and in the trails of a brush dragged through wet paint to record the wafting smoke of the sitter’s ever-present cigar. 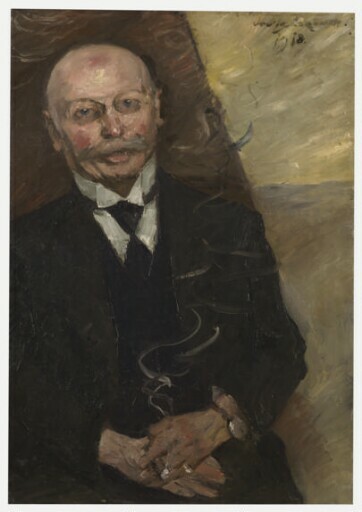 In Germany, Lovis Corinth is revered as one of the great heroes of modern art and as a critical figure in the history of German Expressionism: painters from Ernst Ludwig Kirchner to Max Beckmann to Georg Baselitz have drawn inspiration from his work. In the United States, his prolific graphic art is collected in depth, but oil paintings are rare. In addition to this portrait, great canvases can be found at the Milwaukee Art Museum, the Harvard Art Museums, and the Museum of Modern Art, New York. Purchased by the Kimbell Art Foundation Fort Worth, 2017.